Are you an experienced photographer growing your portfolio? Or a novice photographer looking for some inspiration and tuition? 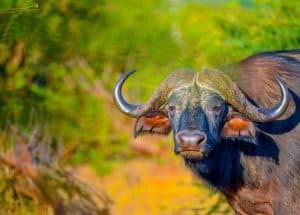 Either or, travellers worldwide have been flocking to Africa to fire off a few frames, and no wonder with the unreal, picturesque scenes Africa has to offer. 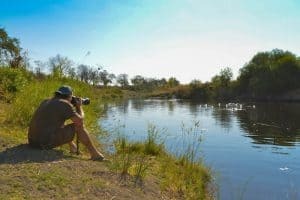 The demand for photographic safaris has increased dramatically, particularly over the past couple of years . So with your own photographic guide from African-Eye, and some bucket list destinations, you can’t go wrong. Robin’s Camp, which is now privately owned, is an iconic safari destination that has recently been revived. Robin’s Camp is situated in the Northern Basalt area of the park, varied with small hills and vast grass plains. There is an abundance of natural water and springs present in the area. Given the amount of water in the area, it is rich with wildlife and home to some of the largest herds of buffalo in the park. It is also concentrated with reed buck, roan, sable, kudu and elephants. Due to the number of prey animals, high concentrations of lions roam the area and if lucky you can spot the cheetah and leopard. 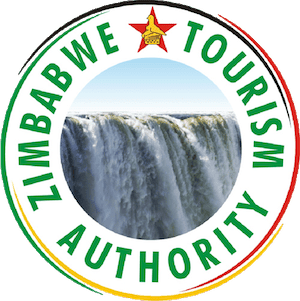 Victoria Falls, also known as ‘Mosi- oa- Tunya’ , ‘The Smoke that Thunders’, is one of earth’s greatest spectacles. Photographers worldwide travel miles to capture a few pictures of this natural beauty. 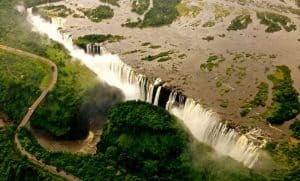 Aside from the iconic waterfall, the town of Victoria Falls is bustling with energy, and has a number of fun filled activities to take part in. 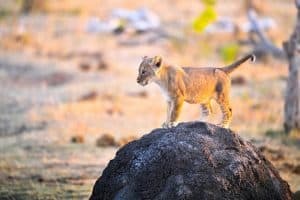 As the town is surrounded by national parks, there are a number of wild animals that roam the town freely, including baboons, warthog, and elephants. On arrival at Robin’s Camp we were welcomed with accommodating and warm hospitality accompanied with a refreshing welcome drink, perfect for a hot summers day. Once we had checked in and settled, we were served an enjoyable light lunch. 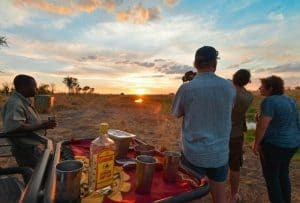 With our own private vehicle and guide, we set off on a game drive in the late afternoon approaching as they call it ‘golden hour’, into the astounding concession of Robin’s Camp. At this time of day the light appears to be undeniably soft and the landscape takes on a warm, honey like appearance. The brilliant colour of the grass, the remarkably green trees and to top it off, the deep blue sky, it’s when even novice photographers, such as myself, can do no wrong. As we approach a large heard of buffalo (no less than 1000), we pull up to an open gap to try snap the perfect shot. The darkened exterior of the buffalo along with the eye-catching golden grass and the blue sky with small hilltops peaking in the skyline, this really gives an advantage of getting that flawless shot with the help of our professional photographer who will constantly be giving you tips. Time passes swiftly, we meander on to a small stream to watch the sun go down. 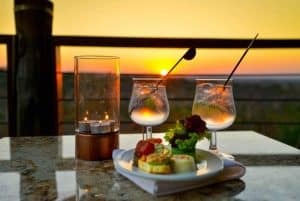 The sky sure gave us an incredible display… tangerine orange, soft pink, sapphire blue and ruby red blending together and creating a reflection on the water, a drink in hand, camera in the other hand while watching the African sun set. What more could one ask for? Once the sun had set we slowly made our way back to camp to enjoy a tasty meal and an early night. At the crack of dawn we awoke and sipped on a hot cup of coffee before we begun our morning game drive. On route we came across numerous antelopes including zebra, reed buck, kudu and giraffe. A couple of kilometres further we encountered a stunning male ostrich with some adorable newly born chicks frantically following behind him. Entirely pleased with this sighting, we carried on towards Big Toms. On route our guide pointed out spoor on the road, as we came to a stop we learned it was lion spoor, and they were headed towards Big Toms! As we near Big Toms, eagerly came out the binoculars, and from the raised platform at Big Toms we caught sight of the lions, a pride of 10 including a cub and a fine looking male, all lounging on the other side of the river bank. Concluding a brisk group discussion, we came to an agreement that we would give the cats their space and return later on in the afternoon, when the light would be better for photographs and the cats would hopefully be more sprightly. We arrived back at camp around 11 am, just in time to cool off in the pool, read a book, and enjoy some mouth watering homemade burgers before heading out into the park again. In the afternoon our prerogative was to find the pride of lions. We had been searching for a while when we came across them lazing around in the shade under some trees. In sight was the exquisite infamous male named Vusi, a female, a sub adult and a cub no more than 6 weeks old, all within 10 metres from us, what a sighting! Not to mention the light improved as time passed, making their fur seem golden. The cub was exceedingly inquisitive, which made it trouble-free to capture a superb shot of the little guy peering at us within a few metres away. He then perched himself on top of an ant hill, almost as if he was posing for the camera. Enthusiastically, we photographed these majestic animals for over an hour, we then made our way back to Big Toms platform to enjoy some sundowners. Once we had returned to camp later that evening, the camp manager informed us of a calf elephant (one week old) that had been rescued from Dolilo Pan earlier that afternoon, the calf had fallen into a water trough. 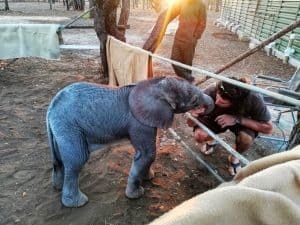 A couple of the employees from Camp Hwange came to the rescue and courageously pulled her out of the trough, sadly the mother never returned for her. She was carted off to Robin’s Camp where she was taken care of for the night, it was indeed a long night ahead for the honourable young man who took her under his wings until the next morning when they would collect her and fly her to an orphanage. At this orphanage the animals are nurtured by one handler until they are strong enough to be re-introduced to the wild and taken in by another herd. We sincerely hope to watch little Dolilo be set back free into the wild one day. After a tremendously eventful day we took delight in some dinner and an early night, ready for another exhilarating day in Africa! At first light we checked on little Dolilo, thankfully she had made it through the night and was still going strong, although exhausted. We set off to watch her be flown off to her new home for the next few years. It all went smoothly and we were extremely joyful to hear later on in the morning that she was settling in well and contentedly gulping down a formula specially put together for her. 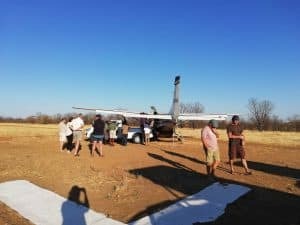 Once we had watched the plane take off, we departed on our adventure in search of Vusi and his pride, hopeful to come across a lion kill. Unfortunately no lion kill, but lucky enough to spot them again for a few minutes before they wandered off into thicker bush to escape from the harsh African heat. We would return at sunset and hope for some activity. We continued on back to camp. Our appetites were booming by the time we got back to camp, we wolfed down a delicious lunch and enjoyed a much needed afternoon siesta. Once we had woken, some tea and cake went down well and we once again ascended the vehicle and went on our way . 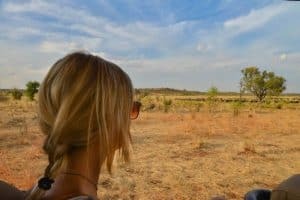 This time passing via Crocodile Pools, where you can come as close as 3-4 metres away from a pod of hippos frolicking in the water with a strong possibility of coming across some crocodiles. As hippos are very curious animals, it makes them fairly effortless to photograph. With the sun directly behind the hippos, this usually wouldn’t work when it comes to taking photographs, but this light was somewhat striking, while illuminating the hippos ears and spray when exhaling…out right exquisite! Wrapping up a satisfying hour of photographing these marvellous animals, we made our way back to Big Toms in high hopes to spot the pride once more. As we approached the view point at Big Toms we caught eye of the pride loafing around on the banks of the Big Toms river, this time all 10 females and the cub were in plain sight, we advanced closer to them to obtain a better view and close up shots. 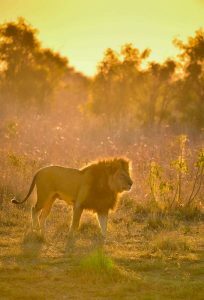 At this stage we couldn’t locate Vusi, but after some time I caught eye of a fantastic scene of Vusi making a terrifically dramatic entrance, with the sun in the backdrop creating a ring light around his impressive mane. Unquestionably, this made for some astounding photographs! We hung around for a while waiting for the pride to get up and into action, alas, no action, although we left satisfied with what we had seen and captured. 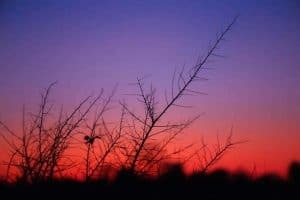 As the sun set we drove on to Little Toms and managed to capture some shots of the exquisite colours in the skyline. On our drive back to camp we were lucky to have spotted a serval and a hyena within close proximity, lurking in the grass. 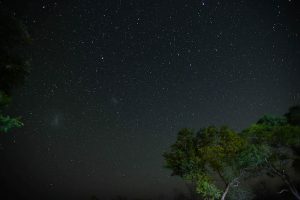 After a pleasant dinner we stayed up to watch the stars and learn night photography with Shaun’s professional expertise. I was delightfully surprised with how the shots came out! Amazing! Following a hearty breakfast, we proceeded with our journey to Victoria Falls. 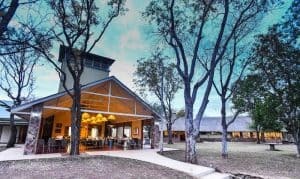 All in all, we had an outstanding stay at Robin’s Camp and would highly recommend it to any traveller looking for that ‘classical African experience’, accompanied by gracious hospitality and a warm homely feel to it, and of course the stunning landscape and wildlife Robin’s has to offer. It is hands down a photographer’s dream and we will undoubtably be back! Once we arrived in Victoria Falls we used part of the afternoon to unwind. Around 3:30 pm we assembled back together for an afternoon private boat cruise on the Mighty Zambezi River. With some cold drinks on ice, our binoculars and cameras ready, we jetted off up river through some uninhabited, untouched islands that preserve some stunning vegetation. The birdlife on the islands is sensational, with over 400 different species, it is a birders dream! 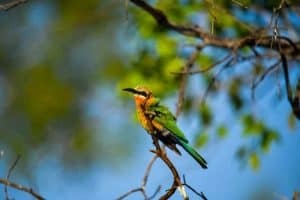 Up close we had sightings of the white fronted bee eater, maribu stalks in their nests, and the african fin foots. 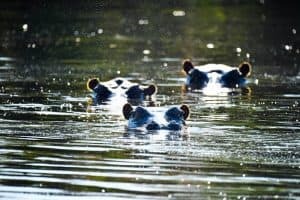 In addition we came within close proximity of a small pod of hippos and the notorious crocodile bathing on the banks of the Zambezi River. As we made our way back down river for sunset, a herd of no less than 15 elephants came down to drink. What a blissful way to end off our cruise, followed by some drinks with the African Sun setting behind the palm trees offshore. 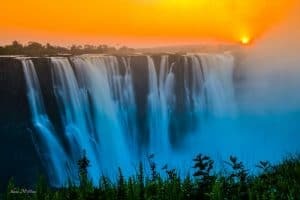 The following morning we entered the magnificent Victoria Falls Park at the crack of dawn. This awe inspiring beauty is a sight on its own, yet sunrise is a segment from your dreams. The sun conveniently rises behind the spray that the falls creates, which generates an image of an orange ball behind the mist, unarguably, this makes it easy to capture a breathtaking, eerie shot. The whole scene is truly magical and other worldly, and with the help of Shaun’s professional knowledge you can surely capture something utterly sensational. As the sun rises higher into the sky, the spray creates a full rainbow over the falls, another feast for the eyes. After the tour we suggest going to the Lookout Cafe for lunch, this cafe has exceptional views. The structure over hangs the extraordinary Batoka Gorge with a frontal view of the bridge. Assuredly, this is a camera worthy view. After another blissful morning, at 2:45 pm sharp we were collected for a game drive with Charles Brightman into the Chamabondo Game Park. Chamabondo consists of breathtaking, abundant flays with numerous view points over looking water holes and blooming tree lines in the horizon. 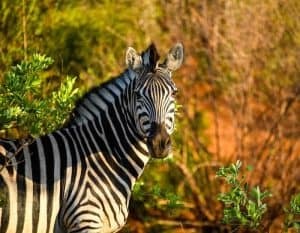 Hand in hand, this entices prodigious amounts of wildlife all year round, including buffalo, giraffe, zebra, elephants, wildebeest, hyena and more. With the sun to our backs we made our way over the dusty road through the open flays. Accompanied by the aid of Charles’ razor sharp eyes, we had the honour of viewing some starlings, bee eaters and more astonishing birdlife. 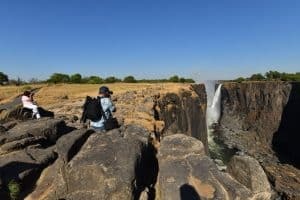 Charles’ suggested we pull up to one of the view points and make our way up the platform, as we did so we laid eyes on a troop of amusing baboons playing amongst each other near the water hole, while sitting in the platform, we enjoyed photographing them for some time. As we were about to embark back into the vehicle a herd of no less than 400 buffalo came out of the tree line into the flay to drink from the water hole. 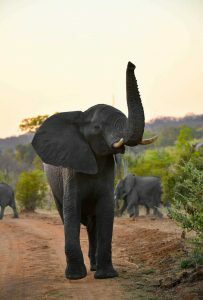 Towards the end of our drive we came upon a small herd of elephants and had the pleasure of watching these giants cross the road directly in front of us, giving us a chance to photograph them up close. Reluctant for the drive to end, we carried on back to town. With Charles’ exceptional knowledge on the bush and our excellent sightings, it was one for the books! The last day of our safari we pleasured in a small sleep in and later on in the morning prepared for a barbecue in the Zambezi National Park. 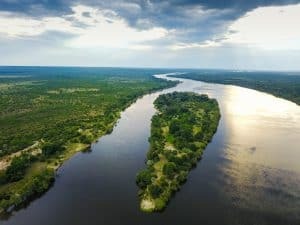 The 56,000 hector Zambezi National Park runs along the banks of the Mighty Zambezi River, although this time of year the river drops considerably, it nevertheless attracts vast amounts of wildlife all year round. 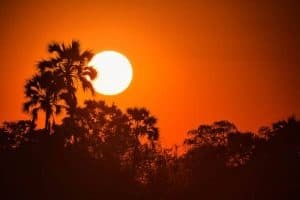 We entered the park at noon, a time of day where the animals tend to tuck away into thicker bush under the shade, escaping the unforgivable midday heat. However, we did spot a number of birds on our drive in, including a rare sighting of the Western Osprey, which is commonly known to hang around Western Africa, we were particularly lucky to have seen this incredible specimen! 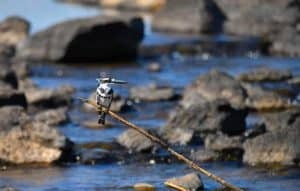 As we neared the end of our drive we set up barbecue at one of the popular picnic sites situated right on the banks of the Zambezi River, with ragged rock pools and numerous flowing rapids within a few metres from us. While taking in the view, a Pied Kingfisher came into our sights, making every effort to catch himself an afternoon snack. He alighted himself on a branch in the river, no more than 10 metres away from us.. a golden window of opportunity right there! To top it off, as we were about to delight ourselves in some barbecue food, a large herd of elephants came down to the river to enjoy a late afternoon swim. This time of year the elephants frequently cross the river onto the islands where they find a more expansive quantity of vegetation, due to the dryness and harsh heat this time of year, the vegetation inland can be somewhat scarce therefore resulting in the elephants seeking food elsewhere. It is a perplexing sight watching these hefty creatures paddle their way effortlessly through the waters of the Zambezi River to these islands, and of course it is the ultimate photo opportunity! Last but not least, we enjoyed some cocktails at the delightful Victoria Falls Safari Lodge before heading back to town. 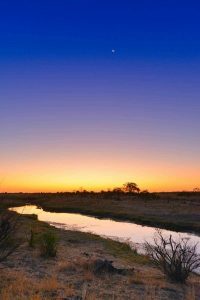 This is a view that never lets one down, looking over a vast plain and a water hole in plain sight in front of the lodge. 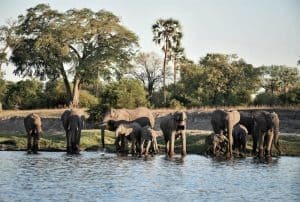 There are frequent sightings of elephant and buffalo that come down to quench their thirst from the water hole as the sun goes down. A smashing way to watch the sunset and to end off of our photographic safari. 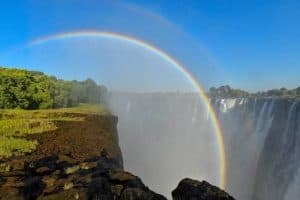 12 Day Honeymoon Safari, Zimbabwe at it’s best!